There are fine novels telling about life in mostly rural Canada. These could be included in a our series on Regionalism in Quebec Fiction. Among such works, two stand out. The first is Claude-Henri Grignon‘s (8 July 1894 – 3 April 1976) Un homme et son péché, and the second, Le Survenant, published in 1945 by Grignon’s cousin Germaine Guèvremont (16 April 1893 – 21 August 1968). It had a sequel: Marie-Didace. But we are no longer in Charlevoix. 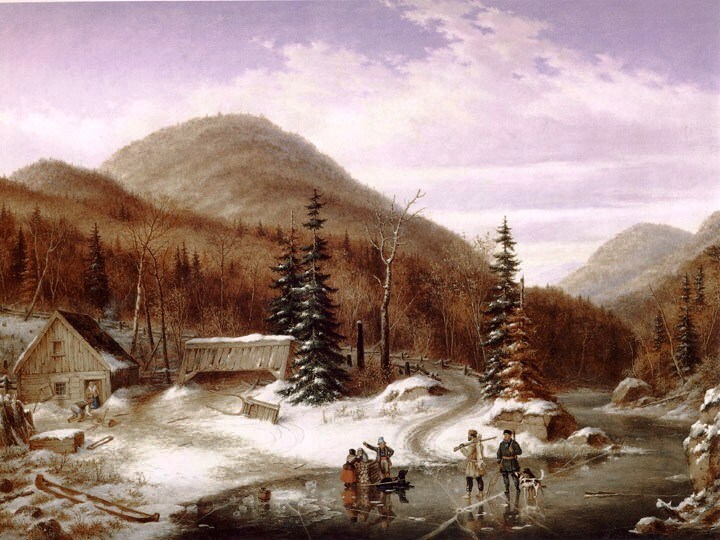 We have moved to Saint-Adèle in the Laurentian mountains, north of Montreal. It is pictured above by Dutch-Canadian artist Cornelius Krieghoff. The importance of the novels mentioned above lies to a considerable extent in the popularity of radio (Un Homme et son péché) or television dramatizations of both. Together with Roger Lemelin‘s La Famille Plouffe, not a roman du terroir, these were programmes, one never skipped. There was a time when French-speaking Canadians watched: Les Belles Histoires des pays d’en haut or d’en-haut (Un Homme et son péché [A Man and his Sin]), La Famille Plouffe, and Le Survenant, as faithfully as they attended Mass on Sunday morning. For the time being, I will tell you about Les Belles Histoires (televised) or Un Homme et son péché (the novel). 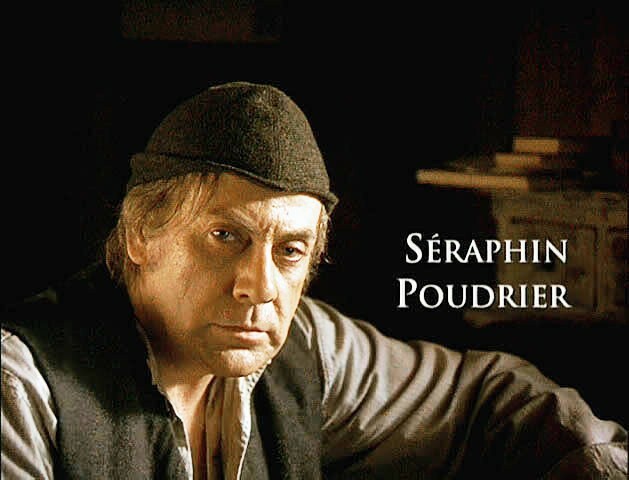 Séraphin Poudrier, the miser, mistreats his beautiful wife, Donalda, and lets her die because calling in a doctor would cost money. The lovely Donalda dies of pneumonia. As for Séraphin, he also meets a sorry end. He lets himself die holding on to his money as a fire burns down his house while everyone is attending Donalda’s funeral. Alexis Labranche, Donalda’s true love, tries to save him repeatedly, but Séraphin will not be separated from his money. After his death, villagers find money inside his clutched hand. If you click on Les Belles Histoires des pays d’en haut, you will note, among other things, that Un Homme et son péché was a 495-episode television series, a téléroman, that featured not only fictional characters, but also real-life celebrities. One of these is Antoine Labelle, le curé Labelle, who directed unemployed French-Canadians/Québécois, mostly farmers out of a land, to settle North. Another is Honoré Mercier (15 October 1840 – 30 October 1894) the 9th Premier of Quebec (Parti Libéral; in office from 1887-1891). Finally, the cast also included Arthur Buies, a journalist, as were Grignon and Guèvremont, an advocate of colonization and the first French-Canadian/Quebec writer to express well-articulated anticlerical views. These three characters, Labelle and Buies in particular, are known to everyone and, in Quebec, a miser is called un séraphin. Claude-Henri Grignon’s Un Homme et son péché (1933) can be included in our list of regionalist novels but only as a borderline example of le roman du terroir. Claude-Henri Grignon was a journalist, known for his “trenchant satire of the government of Maurice Duplessis.” (Wikipedia) Duplessis was the 16th and profoundly corrupt Premier of the Province of Quebec (in office from 1936 to 1939, and from 1944 to 1959). However, it is a novel of the land inasmuch as le curé Labelle and Arthur Buies are advocates of colonisation. Grignon, who became a member of the Royal Society of Canada, was not just another journalist no more than he was just another novelist. He was an exceptionally keen observer of Quebec society and provided an excellent chronicle of “la belle province.” Un Homme et son péché is a satire of rural life in Quebec that mesmerized both readers and television viewers. As I noted above, the televised series was preceded by a radio-drama. Un Homme et son péché has been adapted into at least two films. The second film dates back to 2002. It is entitled Séraphin: un Homme et son péché and it has an English-language version: Heart of Stone (trailer), a third film (?). As for the novel, Un Homme et son péché, it was translated into English as The Woman and the Miser (1978). Next, we will look a Grignon’s cousin’s Le Survenant (The Wanderer) and Marie-Didace, Le Survenant‘s sequel which aired briefly in the late 1950s. Guèvremont’s novels are closer to the roman de la terre, or roman du terroir, the novel of the land, or regionalist, than Grignon’s Un Homme et son péché. Yet, Germaine Guèvremont wrote Le Survenant in 1945, after Ringuet or Philippe Panneton’s Trente Arpents (1938). I love your blog and have nominated you for the Illuminating Blogger Award. The procedure can be found here: http://becomingmadame.wordpress.com/appreciation/! Take care!